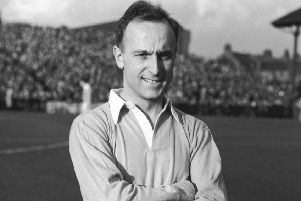 Alex Main was the doyen of the Highland Press world and won 14 trophies as manager of former Highland League side Caledonian. Alex began his career in journalism in 1947 with the Inverness Courier and went on to work for the Highland News, Football Times, Press and Journal, Daily Mail, ­Daily Express, the Scotsman and finally back to the Courier. He retired on 25 April 1997. He is a former winner of the Barron Trophy, which recognises lifetime achievement in journalism. He was also awarded life membership of the National Union of Journalists. He was a keen golfer and a former captain of ­Fortrose and Rosemarkie Golf Club. However, he was probably best known for his football exploits. He was a left sided half back with both Inverness Clachnacuddin and Caley, beginning his footballing career with Clach Rangers. He was a member of the ­Caledonian FC Committee before emerging as manager of the club. He went on to win an impressive 14 trophies, including four league titles. With his writing skills, he wrote a history of Caledonian FC in 1986 – Caley All the Way – The First Hundred Years. Gordon Fyfe, chairman of the Highlands and Islands Media Awards judging panel, knew Alex as a fellow journalist, golf partner and as a player under Alex at Caledonian for ten years. “His 50 years of service to journalism in the Highlands and Islands is without equal. His fairness, accuracy, impressive network of contacts and nose for a story singled him out as a top reporter. John Ross, chairman of the Highlands and Islands Press Ball and former Highlands and Islands correspondent with The Scotsman, said: “Alex was one of the finest journalists in an era of fierce competitiveness in the newspaper industry. He was hugely respected by his colleagues, but also those he wrote about. The club won the Rothman’s Football Yearbook non-league team of the year in 1981-82. In 1982-83 they won 23 and drew seven games in being undefeated in winning the title. Peter, who went on to ­manage Caley during a 14-year association with the club, described Alex as one of the most successful managers in the history of the Highland League.